This a Sealed 4 Car Set. 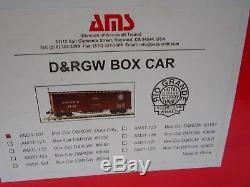 D&RGW Box Car Data Only. Scale/Gauge 1:20.3 Scale / 45 mm Gauge. Minimum Radius 1.2 M, 48 in. Construction Plastic body Length 521 mm 20 1/2 in. Width 130 mm 5 1/8 in. Height 180 mm 7 1/16 in. Weight 1.85 kg 4 lbs. Die-cast trucks, Metal wheels, Detailed underbody. Operating doors, Brass handrails, Ladders & corner steps. 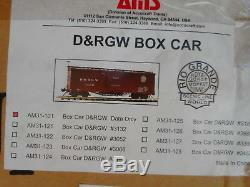 The item "4 Cars Accucraft / AMS AM31-101 D&RGW Box Car Data Only NARROW GAUGE 120.3 Scal" is in sale since Saturday, June 2, 2018. 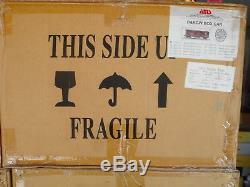 This item is in the category "Toys & Hobbies\Model Railroads & Trains\Narrow Gauge\Freight Cars". The seller is "mnvjohn" and is located in Henderson, Nevada. This item can be shipped worldwide.